Upon observing the exemplary success of famous business magnates like Jeff Bezos or Pierre Omidyar or Jack Ma, a number of people tried to follow them with similar intentions on their mind. Yet only a few of them became successful. Most of the marketplace builders are either overpriced or poor in feature and so many people think that building an Amazon or eBay like marketplace is like reaching for the stars. Contrary to the cliche belief, Dokan Multivendor plugin for WordPress is one of the very few easy-to-use and flexible solutions out there with which you can create a marketplace accommodating multiple vendors even if your budget is very low. Most importantly, it will let you enjoy earning a handsome amount of bucks from your vendors in the form of commission. In this article, I will walk you through how you can swiftly create marketplaces like those of Amazon, eBay, and Alibaba with WordPress using Dokan. Now, without further ado, let’s dive right in with full steam ahead! Basically, Dokan runs on WooCommerce, the very well-known open source eCommerce platform, and enhances the functionality in a unique way. How? WooCommerce can be used to build an online store for only one seller. But with Dokan by its side, you can create an eCommerce site with a whole slew of options like multivendor functionality, improved shipping system for vendors, single page operation for faster user experience and many more. The plugin is developed by weDevs that specialize in developing WordPress plugins and themes. The company started its journey in 2008 and has continued with developing a series of plugins and themes. The number of their plugin’s total active users is over 45000 whilst Dokan itself has over 10000 active users. Their famous products are Dokan, WeForms, and WordPress User Frontend. The installation process is super easy like any other WordPress plugin! You can search for the keyword “Dokan” in WordPress plugin directory to find and install the free version on your WordPress powered website. Please note that Dokan will only work provided that you have installed WooCommerce first on your WordPress website. After installing Dokan, out of the box, you will get a setup wizard which will help you get through a few simple steps to configure your marketplace. Need more flexibility? It has Premium Versions! If you want to run a more thorough online marketplace with rich & interactive features, you can look into their PRO versions. 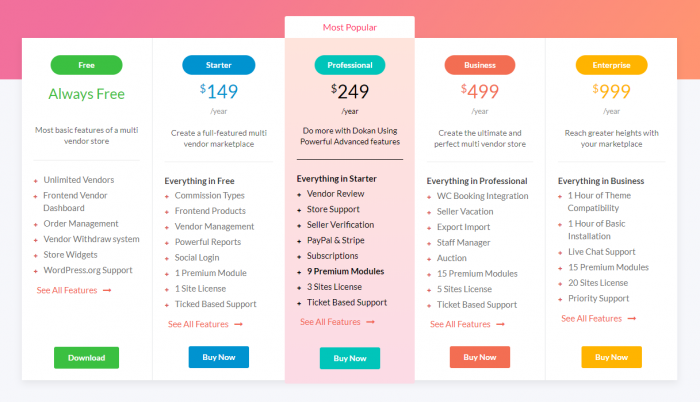 The developers of weDevs have created 4 different pricing plans for Dokan to suit the different needs of their users: Personal, Professional, Business, Enterprise. Dokan PRO versions also come with a bonus: free Dokan theme. It may help you to know that Dokan is also perfectly mobile compatible and works with most WooCommerce themes. So your visitors can easily run your eCommerce marketplace on portable devices. Installing Dokan PRO is also a simple process. Just download the ZIP file from your account dashboard after purchase, then upload it from your WordPress Dashboard where the Plugins directory is located. In case you are using FTP for transferring files to the server, then simply unzip the plugin and ensure uploading dokan-plugin directory to the /wp-content/plugins/ directory. Why choose Dokan over other multivendor marketplace solutions? 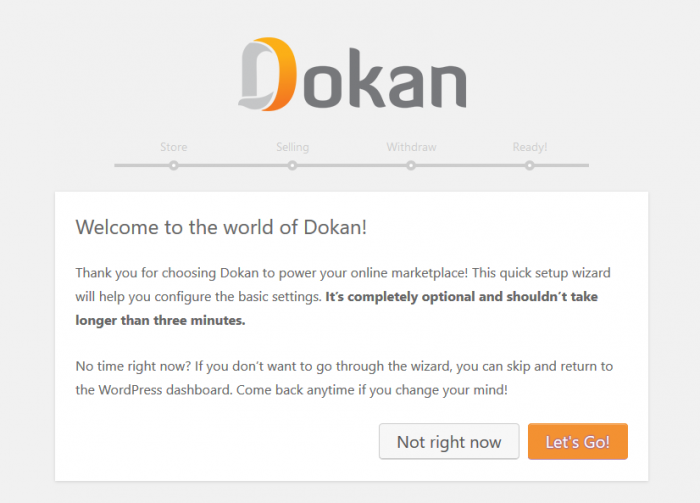 Installing and configuring Dokan is only a matter of a few clicks. After installing Dokan, it’s setup wizard will direct you to configure the basic stuff. These directions will let you start your own multivendor marketplace within 5 minutes. As a WordPress enthusiast, I know how much pain it can be while setting up and configuring a plugin without proper documentation. Fortunately, if you visit the official website of Dokan, you will find a detailed knowledge hub consisting of all the necessary information. Their documentation base is the perfect go-to source to help you set up a full-fledged online marketplace! 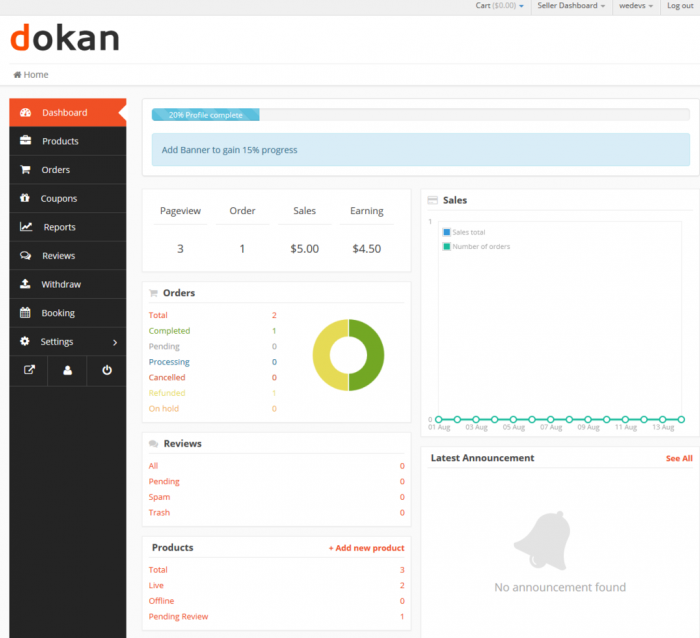 The engineering of Dokan plugin makes running an eCommerce an enjoyable experience and something that’s easy to handle and deal with. The overall amalgamation of Dokan’s UI and features create a friendly environment for beginners, both for admins and sellers as well. Dokan has a remarkable and essential feature for eCommerce that is not yet available in any of the other multivendor solutions for WordPress. The ticketing system is a popular and extremely demanded feature to successfully run an online business. Because it lets you solve your customer queries in an organized way. The Store Support module of Dokan lets clients directly communicate with their vendors and forward their issues or queries in the form of tickets. There’s no limit to the number of replies allowed within a single ticket! The icing on the cake: do it all from a single screen. This keeps all client issues neatly organized and tracked in a single dashboard for the vendors. 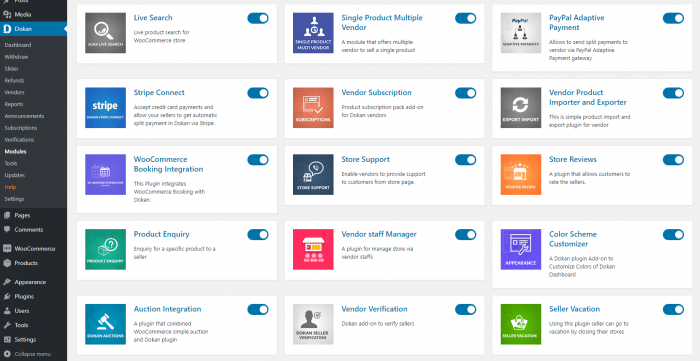 Like a traditional brick and mortar store, vendors can even employ unlimited staffs to manage their online stores from frontend dashboard if you use the vendor staff management module. However, your vendors may feel a bit wary of the privacy of their dashboard information. The developers of Dokan didn’t forget to add ‘restricted access’ option to the vendor dashboard to restrict access to the staffs hired by the vendors. This helps the vendors to ensure enhanced privacy and security of the vendors’ dashboard information. 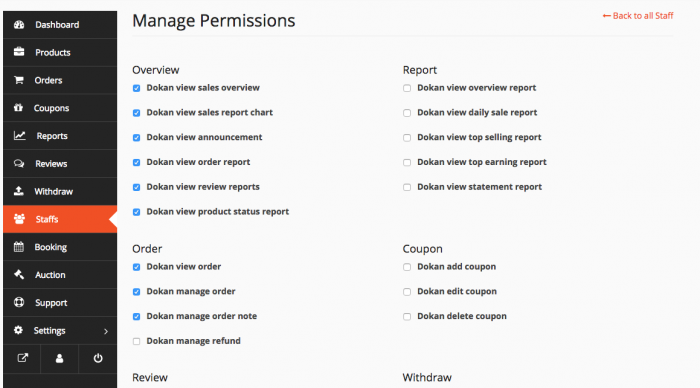 With the recent release of Dokan Pro (version 2.8.1), the marketplace solution will be even faster to manage for the admins. Why? Because it will be using the powerful REST APIs to manage from single page ready to give you better user experience. If a certain vendor within your marketplace wants to sell another vendor’s products, it’s only a matter of a click. All you need to do is just turn on the “Single Product Multiple Vendor” module. When you do so, the vendors will be able to see a button called “Sale this item” beside every product within the marketplace. The only thing that the vendor needs to do is hit the “Sale this item” button and it will be done in a second. However, the vendor will also get options for editing the newly selected product. In this case, the main advantage is that the vendor doesn’t need to upload and write product specification from scratch over and over again. As an admin of Dokan vendor marketplace, you can earn commissions in different ways from your vendors. 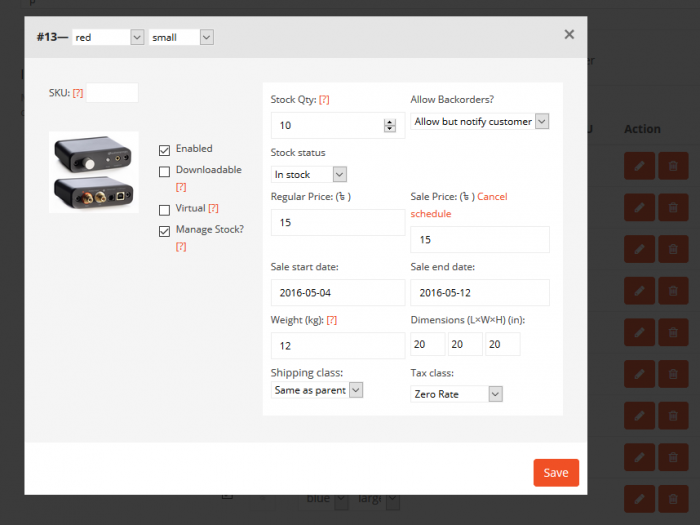 You will be able to set commission based on the orders, products, store or product category. This commission system helps you to earn profits without investing a huge amount of money. Sounds cool, right? Dokan multivendor supports variable products which means you can add product attributes like prices, images, stocks and many more as per the variation of the product. An example of such product can be a t-shirt which can be offered in various colors and sizes. As your marketplace goes through the ceiling, you may have numerous vendors in your marketplace and you need to know the earning statement of your vendors. 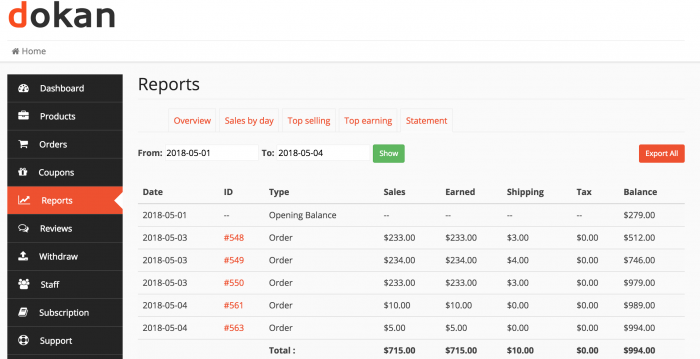 No matter how many vendors register on your site, the automated calculator of Dokan will help you to keep track of every vendor’s earning statement report. Previously, the modules were available as 15 separately paid extensions. Later on, those extensions came unified with the core software. That means you will get extensions in the form of modules with which you can do things like faster search tool to find products, allow your vendors to export/import product data or to change the appearance of their individual dashboard according to the third party themes, verify whether your seller is authentic or not, help your vendor to be directly contacted by their customers and so on. Note that modules like Product Duplicator and PDF invoice come free of cost with the core software. Here comes the big deal! What’s the use of possessing an online store that fails to drive visitors? With the free Store SEO feature, Dokan creates a massive opportunity for your vendors to have their respective store ranked in search engines and get more visibility in social networking platforms like Facebook and Twitter. Note that you can not avail this feature unless you install Yoast SEO. 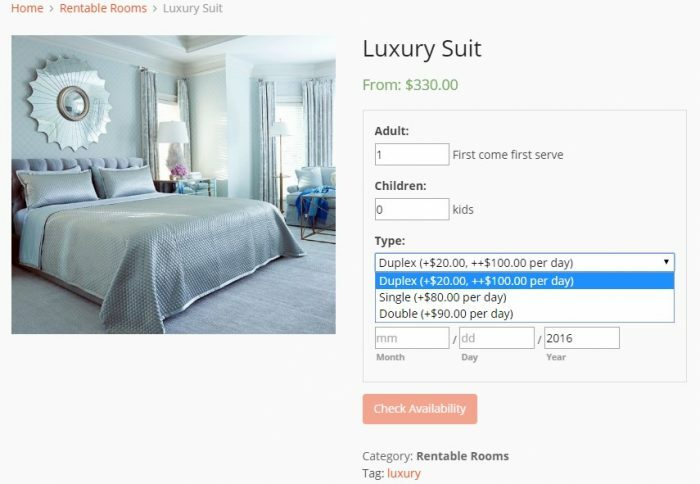 With Dokan Booking extension, your vendors can sell any kinds of bookable products like Hotel Rooms, Resort, Conference Rooms, Cars, Bikes etc. What’s more! The vendors can give the opportunity to customers to customize their booking orders. Note: To avail the booking service from Dokan, you need WooCommerce Bookings Plugin as Dokan uses WooCommerce as the backup platform for all sorts of transactions. Dokan Auctions extension will help your vendors to build an eBay-like store for auctionable products accompanied by his regular products. 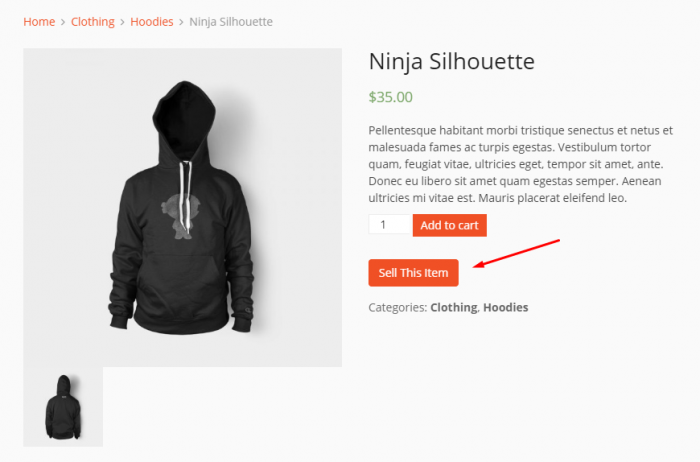 The auction extension of Dokan requires WooCommerce Simple Auctions plugin that you will have to purchase separately from CodeCanyon. Note that these two extensions ships with any pricing plan of Dokan. Some of your requirements may need customization. But that’s only natural. Having a flexible platform is a 100% need to run any online business as you go. And I’m big on this feature. Building on the fact that Dokan is open source, and you can expand it as you like, the Dokan developers have decided to work on customization and feature requests of their users. So you can pay and adapt your Dokan-powered marketplace with your business needs and features that you prefer. The plugin is continually improving and developing and there are still many spaces that can be improved, such as, reports and data analytics. Good news is you will be seeing some important developments in the next series of releases of Dokan Multivendor. These updates are promising enough to take the plugin to extraordinary heights. The developers are already working on excellent features, like, vendor and admin analytics, live chat, and report abuse for spammers. Undoubtedly, the trend of buying from online marketplaces among millennials, Generation Z and even in some cases Generation X are on the rise like never before. The good news is that there is no sign that this popularity will soon be on the wane. While there are a number of solutions out there, Dokan Multivendor plugin for WordPress is an eCommerce builder that is both budget- and beginner-friendly. In addition, Dokan has been developed with all the relevant bells and whistles not just for the admins but for the vendors as well. So, if you are planning to build your own multi-seller marketplace then you are on the right track and you can flat-out go for Dokan to have your multivendor marketplace up and running right away. Does this allow vendors to have their own eCommerce account and the marketplace owner to take commissions from each vendor? Very good review, it is a great plugin and in my opinion the best one out there. All of these multivendor plugins seem to copy one another and only a very few things are unique about them. I just can’t believe that after years of development of these plugins that they haven’t found a way to add a simple option to let people specify the condition of the item. New/Used/maybe include sub-conditions. eBay does this, Amazon does this for third-party vendors. 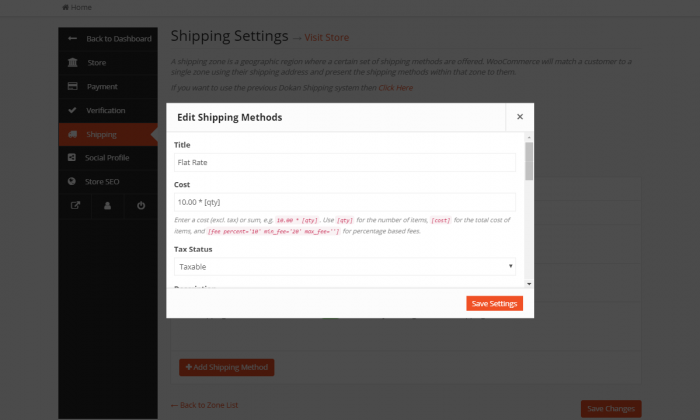 There are ways to do “options”, but they aren’t easy to use at all for a novice web person. Another thing none of them do is consider global currency. Sure there are currency converters out there, but none allow vendors to list items in their native currency and then the site converts for you. They claim its a weakness of WooCommerce. A good developer should know how to address this. That would really make one of these pay for plugins stand out. Just my two cents. Thanks for your great suggestion. We got a couple of request about the condition field which will define the item condition as New or Used. We could add this field but as you know that Dokan is based on WooCommerce and by default WooCommerce does not have such kind of condition for uploading a simple or variable product. However, the item condition is a default function of Dokan Auction module. Now, I am keeping your suggestion on our list and if we get more request about the item condition then we will think about it to implement in near future 🙂 For now we suggest to add custom field to get such kind condition as our plugin is fully customizable so, anyone can add a field by using action/filter. We always help our customer to find out the correct file location with the available filter/hook. Also, we were trying hard to integrate the multi-currency functionality but we found some technical limitation. As Dokan is a multivendor platform so, it is really complex to manage calculation in multi-currency. Still, we are looking for a way to integrate such kind of functionality. Nice review but this plugin isn’t very good actually, because what’s making it not that good is its prices, the lake of support! It very bad, I personally consider it even worse if this was a free plugin! Those people need lessons in customer support, I used to purchase their plugin for a year, I was going to renew my license but for such support I cancelled my renewal and went for unlicensed version for from another trusted website for just 20$ a year and I managed to spend the rest of 499$ on a developer to address and fix my issues!, And yes i tried with them a lot! Also in bug reporting, I reported a bug that exists in their module store support, vendor customers cannot check their tickets as the link to support page from user my-account is showing a blank page, and it has been a month and they didn’t even issue an instant update for their paid customers, short story their aka “premium support” is a joke! But the software is good, so before going after that marketing, just be aware that there is no support their what so ever! I feel sad to hear that you had to purchase nulled version because you were not getting any solution. However, we have fixed the support module issue and our support team is implementing the fix on the client website. Our team was trying to find your ticket but we did not get any ticket with the name JOSEPH ANTONIO. As it is really hard to provide a solution in public place So, I would request you to send us an email so that we can help you.